If you ever daydreamed about joining Alice, the Mad Hatter, and other colorful characters at their famed afternoon tea in the book “Alice in Wonderland,” this is your chance. The Alice in Wonderland Tea Event is a fun and lively afternoon that will feature a grand afternoon tea, plenty of nonsense and whimsy, and a group of mad hatters who can meet and mingle while enjoying the relaxed atmosphere that the Crystal Coast is known for. There’s a host of reasons to explore a creative side, as well as the picturesque Swansboro waterfront, at the Swansboro Arts by the Sea Festival. 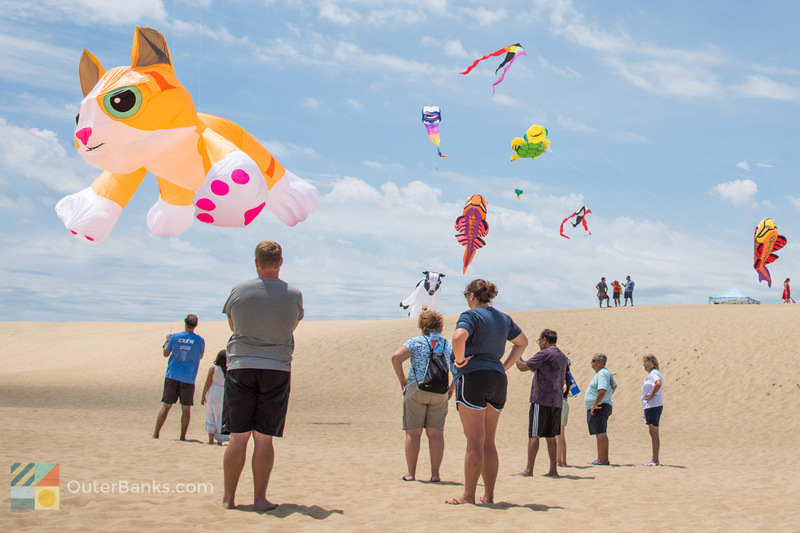 This unique and day-long festival has a wealth of activities, entertainment and enticements for everyone in the family, and with plenty of food, crafts, children’s activities, shopping opportunities and more, the festival is sure to be a highlight of any Crystal Coast vacation. Young residents and visitors who have always dreamed of charting their own course on their water can learn all about the basics of sailing and beyond at the summertime Junior Sailing Program. This day camp that is open to all children ages 8 and over will cover everything that young mariners need to know about two classes of sailboats, and is an immersive and fun way to discover a new skill while enjoying the open waters of Beaufort, N.C.
Take a break from the sunny Crystal Coast beaches and celebrate the 4th of July holiday with a little local style at the annual Pine Knoll Shores Independence Day Parade. This popular small town celebration features plenty of ways to join in the fun, from donning your best red, white and blue attire, to decorating a bike or cart and marching in the procession, and the high spirits and entertainment is sure to start any Independence Day celebration off with a bang. The youngest members of your vacationing party will have a ball at this special event that’s designed just for them, and which features a wealth of free activities that everyone in the family can enjoy. Emerald Isle Day4Kids is a special celebration that features plenty of fair-style games, food, and other activities that showcase how fun Emerald Isle can be. If you’re a southern seafood fan, then you’re going to love the annual Mullet Festival of Swansboro. This two-day affair features a wealth of ways to enjoy this local crystal coast staple, as well as plenty of games and activities that celebrate the food, flavor, and all around fun of the heart of Swansboro and the North Carolina coastline. Set sail to the small town of Beaufort, NC for this engaging event where mariners can meet and mingle with their water loving colleagues. The Fall In-The-Water Meet is a fun gathering that’s wide open to experienced mariners and newcomers alike, and which features a host of fun activities including free boat rides a pig pickin’, and plenty of opportunities to learn all about life on the water in this small and charming town. Get a jump start on your holiday shopping while enjoying an inviting and relaxed atmosphere that is miles away from ordinary at the Jumble Sale at the Beaufort Historic Site. This annual sale that takes place around Thanksgiving is the perfect cure to the Black Friday blues, and offers a wealth of locally made, handcrafted, and wholly unique goodies and presents that can’t be found anywhere else, and which will truly add a dose of local flavor to your holiday gift giving. Celebrating more than 15 years, the Emerald Isle Christmas Parade & Tree Lighting is a favorite wintertime event for visitors and locals alike that provides a fun and unforgettable way to ring in the season. Held in the heart of town, and featuring a line of floats that capture both the holiday and the coastal spirit, this annual parade and celebration will make everyone want to celebrate the holidays, Emerald Isle style. Get into the spirit of the season while enjoying a picturesque taste of life on the water in a small North Carolina town with this event that offers plenty of spectacular views and festivities for spectators and participants alike. The Annual Crystal Coast Christmas Flotilla is a local tradition that’s been going strong for more than 25 years, and is an opportunity for both visitors and locals to enjoy a festive display unlike any other along the Crystal Coast. The summertime Beaufort Farmer’s Market is revitalized for the holidays at this special annual event that combines Christmas shopping, local fare, kids’ activities, and plenty of community spirit. The Old Fashioned Holiday Farmer’s Market is celebrating its 5th year in 2019, and is a delightful opportunity to connect with local fishermen, bakers, craftsmen, artists, and vendors of all varieties to load up on unique holiday presents, or to take home some goodies of your own.